European Tour Properties has entered new territory by welcoming its first Chinese venue, Genzon Golf Club, to its portfolio of Destinations. 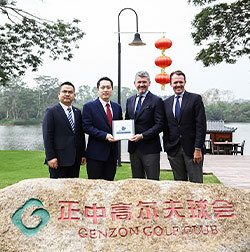 Located in the Longgang district of China, near Hong Kong, Genzon Golf Club is the first Chinese venue to join European Tour Properties’ world class network of Destinations. The state-of-the-art golf club features a 36-hole Championship course, split into two and classified as A and B, and is designed by renowned designer Neil Haworth, following ecological principles and preserving the original mountain vegetation and topography. Course A is sculpted around the 700-acre Dragon Lake, while Course B is set against a mountainous backdrop and incorporates deep undulating fairways. A vast practice area accompanies the outstanding courses, with 33 grass bays and an indoor smart driving range. In addition, two putting greens with top quality surfaces give players the chance to hone their short game. Although new to European Tour Properties’ portfolio, Genzon Golf Club is no stranger to European Tour events. The Shenzhen venue played host to the 2014 Volvo China Open, won by Alexander Levy, as the event celebrated its 20th anniversary. The Shenzhen International also took place at Genzon between 2015-2017, making it the first Chinese venue to host two different European Tour events. Iain McInally, Head of European Tour Properties, said: “Genzon Golf Club is a stunning venue and we are delighted to welcome them into our family. “It is truly a world class venue, having previously hosted the Volvo China Open, and we are excited to work with them to maintain and enhance those incredibly high standards. Mr Ali Kong, Deputy General Manager of Genzon Golf Club, said: “Genzon Golf Club is extremely honoured to join European Tour Properties as the first Destination in China. “Through European Tour Properties, which is a high-quality platform, we hope to gather more like-minded people with shared mindsets to bring greater value to our members. “Golf, a unique sport with a profound sporting spirit, is an international business language. In China, as a members-only golf club, we feel proud of where we are today. The European Tour celebrates men’s professional golf on a global stage, combining innovation, diversity and world-class golf. In 2019, the European Tour International Schedule will feature a minimum of 48 tournaments in 31 countries, including eight Rolex Series events, all part of the Race to Dubai. The European Tour broadcasts live coverage of its tournaments to more than 490 million homes in more than 150 countries every week, generating in excess of 2,200 global broadcast hours for each event. It also enjoys the support of many of the world’s leading business brands with Rolex, BMW, Dubai Duty Free, Emirates, Hilton and Titleist as Official Partners. European Tour Properties is a global network of over 30 world-class golf venues across more than 20 countries on three continents, which all have a close relationship with the European Tour, one of the game’s foremost organisations. The network includes some of the most prestigious golf and lifestyle resorts in Europe, the Middle East, South East Asia, the Indian Ocean and Russia, with many of the venues home to courses which consistently feature prominently in international rankings. European Tour Destinations also host an array of prestigious tournaments, including the Ryder Cup and DP World Tour Championship. The network also boasts the only two European Tour Performance Institutes in the world, at Terre Blanche Hotel Spa Golf Resort in Provence, and Jumeirah Golf Estates in Dubai. The ETPI bases at both venues use the world class knowledge of the European Tour’s medical and performance services team and the latest in swing technology to improve the game of golfers of all abilities.